UN agency for “Palestinian refugees” cuts more than 250 jobs in Judea, Samaria and Gaza. UNRWA, the United Nations agency for “Palestinian refugees”, announced Wednesday it was cutting more than 250 jobs after the United States held back hundreds of millions in aid, AFP reported. In total, 154 employees in the Palestinian Authority-assigned areas of Judea and Samaria and 113 in Gaza will be let go, UNRWA spokesman Chris Gunness said in a statement. Wednesday’s job cuts were the first since that announcement. Gunness's statement said the U.S. cut represented an "existential threat" to UNRWA, which had been trying to raise the money from other donors. The organization has received pledges of $100 million in additional funding from Qatar, Canada, Switzerland, Turkey, New Zealand, Norway, Korea, Mexico, Slovakia, India and France as a means of making up for the aid that was cut by Washington. UNRWA said last month that it had managed to pay salaries and provide some services, but also said there was still a large budget deficit of $256 million. Amal al-Batsh, deputy head of UNRWA's staff union, condemned the announced cuts. "The decisions are unfair and will adversely affect employees and their families," she told AFP. Hundreds of people rallied outside UNRWA's headquarters in Gaza City to protest against the decision to axe jobs, as the union called for a sit-in. "The letters sent today are not letters of dismissal. It is a death certificate for us and our families," said UNRWA employee Anwar Hamad. 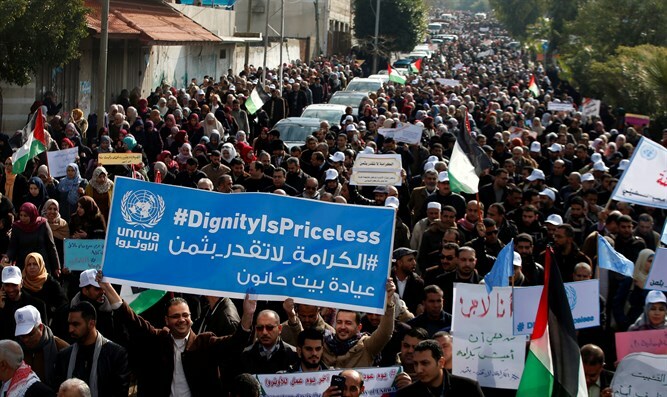 The UNRWA staff union also called for a general strike by employees to be held on Thursday in Gaza. Gunness' statement said UNRWA was seeking to "protect core services, including education, health and relief", and to ensure the schools they run in PA-assigned territories, Lebanon, Jordan and elsewhere open on time after the summer holidays. "The decision of the U.S. to cut $300 million in funding to UNRWA this year has been described by our commissioner general as an existential threat to UNRWA," he said. "As we continue to pursue every avenue of support to overcome a severe financial crisis, UNRWA, its dedicated staff and the refugees have only one option: to face up to this situation together and preserve the most important work we do."